So when I got home from work that day I did some speed tests and was pleasantly surprised that it was true! Previous Post Speed on Demand page finally loads! Omg! My name is there :O. Erm.. I actually experienced d faster surfing on loading page, so i went to speedtest.net n did some speed test. Yet, i was surprising tat it has reached almost 1Mbps DL, and UL 300Kbps.. Seem like everyone here got there speed upgrade, but the download speed doesn’t seem to increase, just like before, it only reach about 20KB. I have done so speed, when you are using p2p, your speed most like to be stuck at 20KB. but try to download a file from download.cnet.com, your speed can reach 2.5mbps using $128 plan. yea, torrent is slow nowadaya and I guess Telbru is trying to restrict/block the Torrent port. Even I try to download one song from 4shared.com, the download speed gave me about 5KB/s below OMG!!! hhmm, i just called my friend living in bandar, He told me his torrent can each 100KB, so it seems the torrent is not blocked. I do have the same problem where all tracker is timed out. but my friend tracker is all private. so there might be a different. my torrent is not working since the 9th of march lol. I try to download from uploading.com, i also got something like 4-9KB…. Does anyone notice their upload is way faster than download? 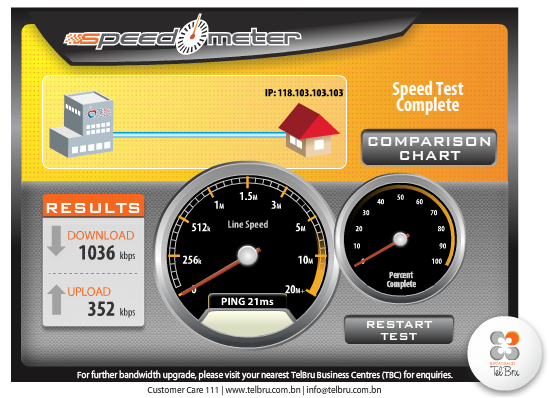 I guess Telbru is still upgrading their server(gateway to the world) although it’s already upgraded their bandwidth. I have been complaining since 9th of march “everyday”. Almost all stuff know my name there, Technician come to my premise everyday, but nothing has changed…. er… what have u do? ask them to change to the new IP? According to @oxba’s tweet they have blocked torrents due to repair works. It seems from their track record Telbru either doesn’t respond or just isn’t forth coming or transparent with the information we (their customers) want and need. While I really dislike not knowing what is going on, complaining can’t do much and persistent calls (about the same problem) to their help center can make things worse. Tech support is hard and stressful because they are usually dealing with annoyed and angry customer complaints. I just hope we all can be civil about these problems and if they are really that bad perhaps consider DST’s Go!, downloads are pretty fast from what I’ve heard, but as well al 3G connections it depends on location and user saturation so your mileage may vary. can you help me to ask abt the download problems? what is their real problem for me cannot download? the speed is totally 0.00 kbps.. When will Speed on demand be available to us ? ok, i can’t accept this reason.. If for you, can you go to coffee bean just to download your stuffs? If the file is with 1.5GB, I’m sure we can’t finish the download in one night, it has to take abt 7~8 hrs to finish downloading them.. *sigh* what’s the use of sitting inside coffee bean just for download stuffs? If we chat with our friends, the most is for 4 hrs..
@sma… where did u hear from about the blocking of p2p requested by shop dealer/owner?? omg.. today’s internet speed is worst… normally i switched on my pc and the internet is connected directly, but today, it takes abt 5~10 minutes to connect.. *sigh* i really wonder what they are doing..
yeah, at least youtube improve a bit… but i still find it slow when loading the web pages.. like facebook..
huh? u also at 0.00 kbps for e-speed? oh well, i borrowed a Alcatel modem from my friend and test.. still, at 0.00 kbps.. Ppl from TelBru called me just now though,, they said they will check again.. on the cable..
@ Tl , u saying at Subok right? U have internet connection now? I totally dun have..
Are u still on 61.6.x.x network?? I am still on 61.6.x.x IP network. But one of my cousin who stay in Sungai Akar got a new IP of 118.x.x.x (guess is new network)., althougb he’s an old espeed user. ok.. i wonder if i wanna believe the technician’s words the other day.. that the p2p cable is only open to the internet cafe..
can’t think of another reason of why we can’t download from p2p related… but there’s also ppl who can download from p2p related right? erm,,, we write to borneo bulletin to complain.. how? I have written to borneo bulletin so many times but it’s only published once since 8th of march? Did you guys really complaint to borneo bulletin. I only see my complaint get through? Dun believe at the technician words! P2p dun work at cafe.. Thats why i’m using web hosting.. I think using “COMPLAIN” this word is totally useless to Telbru nowadays. As u can see that, some problem/issues leave it as transparent to some users. The test speeds are much improved but there must still be some traffic shaping. Torrents don’t connect and I used a torrent file supported by high speed servers in the USA as a check. No connection. Last week I d/led this file at over 200kBps. It’s bit of a slap in the face to read ‘excess’ bandwidth is being leased out when local customers pay excessive fees for unsteady service. I noticed this problem since the 8th of March. I am the one written to Borneo bulletin complaining about the local test meter. but as you see they reply in opinion page stating that the local tester is essential, but then they didn’t even mention about outside brunei in Borneo bulletin. I have been complaining everyday since 8th of march but i actually given up. I have been finding alternative and cost me a lot of money. I am a torrent user and i found out anything p2p related is slowed. I check the direct download from server is fine on reaching full speed. What a waste of money…. Dun give up.. we dun want we pay lots of money and they give us the speed like this right? I will complain again, until everything go normal like before..
Let us call again later, regarding abt the p2p problem.. see what they tell us this time..
hey, how’s everyone’s p2p now? just saw on Twitter that TelBru said its ok with them oredi? I wonder new network work well on p2p… New network able to use speed on demand while old netwrk cant. I’ve asked telbru in twitter las tym & they said ‘future’ to me… WHEN? Next mth, next yr,next 10yr? Torrent worked well for me since yesterday. I tried to download one file from certain torrent site & it gave me a download speed of 20+ – 49+ KB/s…which is consider ok.. I am still on old network & cant use “speed on demand”, but nevermind who care about this service..
telbru will reach two month milestone of dissatisfaction from their customer, hooray!! all line still blocked for torrent at about 50KB…. I download the sims 3 size 5.7gb from torrent only 3 days..hahaha..
oh finally got someone download from clubbox also..
well, i’m lazy to complain everyday, but clubbox is where my source comes from, so i’m really hoping that it can be fix very soon, have u made your complain as well? nope.. no idea where to report to… i cant even download from torrents or clubbox.. sad life..
i think i ll go with the twittering.. i m not gud with making phone calls… Wat should i type there? telbru has reached three months milestone of dissatisfaction from their customer, hooray!! Nothing has been done at all for the past three month and now youtube problem, hotfile.com not working, rapidshare is slow…. Itz a lie! I’m on $128 line plan, but I’m still having around 1MiBps bandwidth. What’s worse is that speed-test shows download 800-1000KiBps [100-125 KBps download] but when I download something, it’s usually 0.5KBps – 4KBps. I’m sure it’s $128 line plan and checked with my dad to make sure. It’s already 4 months and still I don’t have the 2.5MiBps. Feels like a rip-off at this point. 4 months is a lot of time, enough time[as I heard user-base is not that big and not that scattered], to roll out the upgrades to different sections[as what they’ve told me they’re doing]. Actually, it was fine about 2 weeks ago, I didn’t get my promised bandwidth but at least download was around 480-640KiBps. It started to crap-down to 5KiBps – 36KiBps around the 26th of July, 2010. The espeed line currently is on and off, a lot of people is guessing the telbru is tying to block the p2p issue which limited our connection speed. It is more like a congestion issue they are experience, I considered myself one of the first person who notice the line speed go down on the 8th of March. Then espeed is suffering for low speed. In the meantime, hong kong line is having a problem which strike by earthquake and then i notice ip change from 61. to 119. oh yea, i know they are moving me to new server. However thing stuck up and yes, all the way from 8 of march until now. which is exactly 5 months now. They might have already invested some rubbish for the server but not to admit it and then on the 1st of April, trying to promote “jokes is over” but the system didn’t perform like they would think of. since then, the story begin…..
p2p block, congestion issue, migration issue, alcatel, hua wei, on site line error, check your cabling, router faulty…. you name it man…they will try to blame everything they can…..
p2p works early morning until 7am. Past 7am the download rate drops straight away to 0. Telbru response to P2P throttling allegation is they are not doing it and they are still “troubleshooting” the problem. They are obviously telling lying for PR purpose which just taint their extremely poor reputation further more among those who are more tech knowledgeable. so what’s i sthe final vertic??? 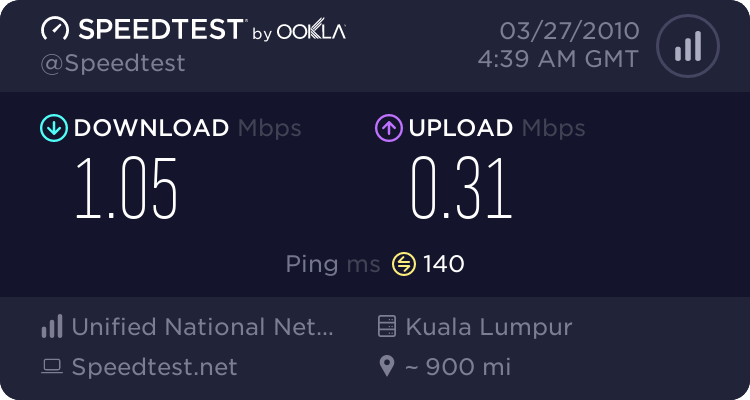 I just moved to Brunei about 1 month ago,, i thought the DST broadband was the way to go,,but apprently i was wrong… I’m currenlty paying $55 amonth not to bad, but i’m lower than snail.. The internet said upto 7.3MB,, year right, I reached 1.24MB at 2AM,, but normally i’m stuck between 2K and 4K (seria) and about 4-6K in Panaga… Should i go to espeed or the omi one? Is the Zoom really work??? All need it o view videos and video chats? 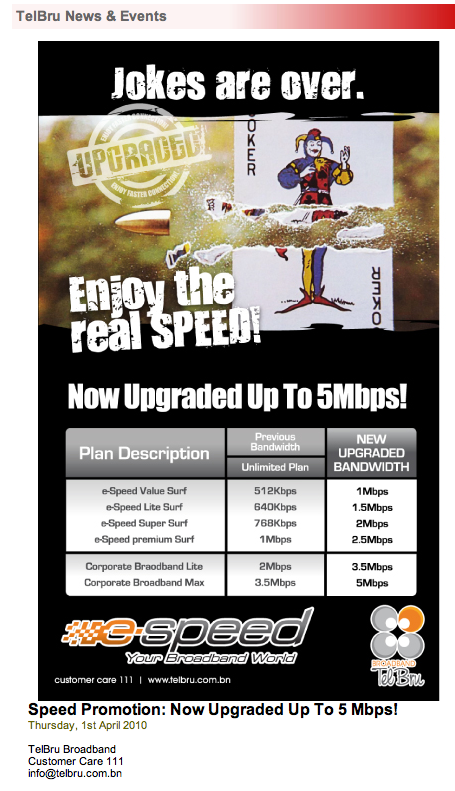 any difference between the espeed and espeed lite.. Can you reach the 1.5MB or espeed value is as good as it’s going to get? @Cesar I can’t confirm whether eSpeed Lite is better than the typical eSpeed Value that most are on. I would think it should be better. It seems that they are having quite a few issues currently. Try Bandwidth tester it should be much easier to execute to check your connection within Brunei. Bandwidth outside the country could just still be a bottleneck issue. If your bandwidth within Brunei is not up to par, contact Telbru to send some people over to check your line connectivity. Ok,i did speed test next to repeater tower (Supa Saver) The fastest i got was 1.4MB @ 7:30PM (not bad at all). Kuala Lumpur, 25 October 2010 – U Mobile today announced that they are taking the first steps to deploy their 42Mbps Mobile Broadband network. Capable of delivering online connection speeds of up to 42 Mb per second, this is deemed the fastest broadband to date in Malaysia and U Mobile is the first to deploy it. P2P program still bloacked… I cant download torrent files anymore if like that.. Only midnight can use torrent until morning 7am only.. What happened actually? They have probably blocked P2P traffic during the day when most people use the Internet in efforts of making the network less congested and hopefully give a better Internet experience. Probably not ideal for everybody but if it helps bring a better Internet experience for Brunei, I honestly have to say I support this. The thing is, they should just limit the speed of p2p rather than completely blocked. What happen to those who download linux image distribution and submit bug report? They should just limit the speed to let said 50K instead of blocking the whole thing. Can anyone help me to check, whether telbru is doing port block? when i use canyouseeme.org to check whether the port is block, most are block excpet those comment one to use like remote desktop and vnc.